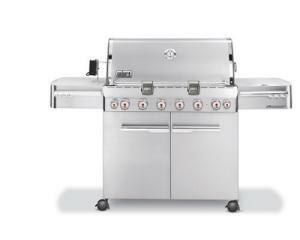 The six burner Weber Summit S-650 Gas Grill includes standard features that you'd only see as add-ons in many other cabinet grills of this class. The 60K BTU burners for the grill are backed up by a 12K BTU side burner, an 8K BTU smoker, and a 10.6K BTU infrared rotissierie burner, giving this grill every essential cooking option the backyard chef requires. The S-650's primary cooking grid of stainless steel bars is just under 700 square inches, plenty of space to cook for large family gatherings. Since the six burners are individually ignited and controlled, you can use as little or as much of that space as you need. Weber's flavorizer bar system prevents flare-ups by converting drippings into vapor that never reaches the flame, so food cooks without char from burning fats. Indirect cooking is not the grill's strong point, with air flow problems that make finding a proper temperature for slow roasting rather difficult -- but the grill comes with a standard rotissierie and dedicated infrared burner for spit roasting larger cuts of meat and whole poultry. Another great feature is a smoker box with its own burner, built into one side of the grill. Just add wood chips, and you have a steady source of flavorful smoke with little mess from the charcoal and ash. Any change in your grilling habits ought to be well balanced by new options. An essential part of any grill is the warranty, and the Weber Summit has a good one, including 25 years on the stainless steel chassis, ten year coverage for burner tubes, and on down to two years for the infrared burner. Make sure you use a good grill cover, because the rust-proof stainless steel cabinet is not rain-proof.